Find out if a Maui zipline adventure with Skyline Eco-Adventures is the right choice for you - by getting ALL the details before you book! 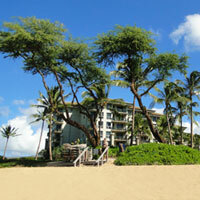 So Skyline Eco Adventures is located in Maui's Upcountry area, on the slopes of the Haleakala Volcano. 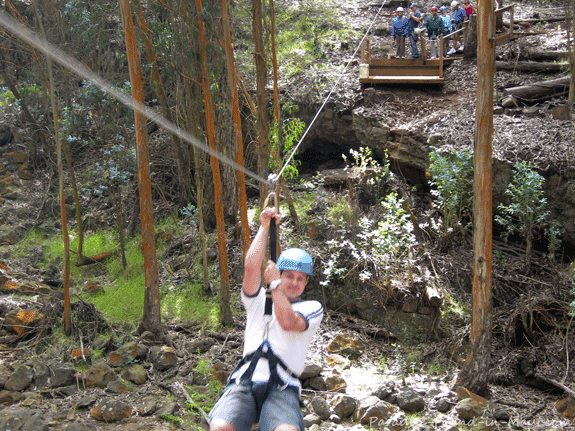 When we chose this particular tour, I was brand new to ziplining, and and not a huge fan of heights. So why on earth would I want to go on a Maui zipline tour, where the primary attraction is whizzing through the air, all the while hanging a tad bit high above the ground? Well, for starters, it sounded like loads of fun. When you first arrive, you'll be outfitted with a harness, and given some instructions. 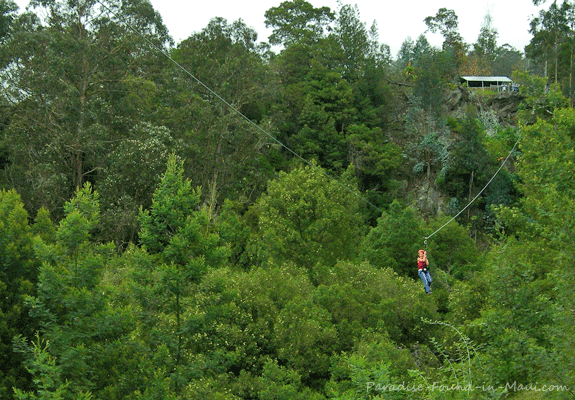 Then you'll be led on a short walk through the forest to your first Maui zipline. You'll probably feel hesitant to step off the platform and start your zip - it's just so counter-intuitive to step off into thin air, right? But trust me, once you get going, the sensation of gliding across that first gorge is positively intoxicating! Remember, the first zip isn't all that high above the ground, and it isn't very long either, so it's easy to push the fear aside and just enjoy the sensations! After this, it was all I could do not to race down the trail to the next zip! But alas, patience was required - you've gotta wait for the others in your group to finish up. One of my favourite parts of the zipline tour was walking across the suspended bridge! We had to hook up our harness to the guide wire running above the bridge as a safety precaution. As you can see in the picture, there were no railings on this bridge, although there were guide wires on either side of you that could be used to balance yourself. I don't know why exactly, but I've always loved a trek across a suspended bridge! Maybe it's the challenge of maintaining my balance as the bridge wobbles beneath me. Maybe it's the little bit of adrenaline pumping when I catch a glimpse of the ground far below! Whatever it is, I just LOVE suspended bridges! The Skyline Eco Adventure team led us through the rest of the ziplines, until we finally got to the best one, which had been saved for last! It was, get this... 380 feet long and 150 feet above the ground! If you're anything like I was, you'll probably feel some trepidation about stepping off the platform for your zip - it's freaking HIGH above the ground, and hey, that's kind of scary. But I can safely say that once you get over that and find the courage to step off that ledge, you'll feel free as a bird zooming across the treetops! Do you see that speck of a person gliding across the treetops? This picture really gives a sense of the length and height of that final Mount Haleakala Maui zipline! It was truly incredible! This experience was fantastic, and I'd definitely do it again. But is this a good tour for you? 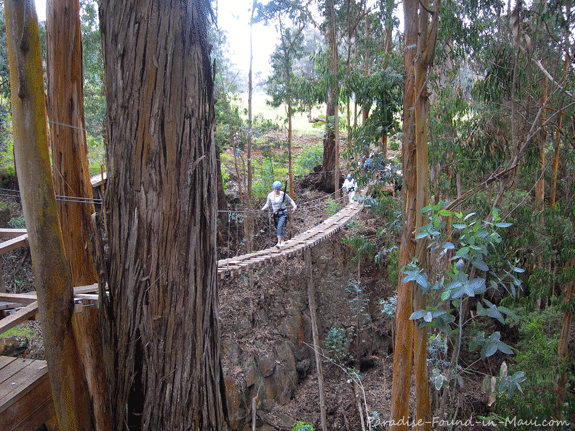 Who Should Choose the Skyline Eco-Adventures Haleakala Maui Zipline Tour? 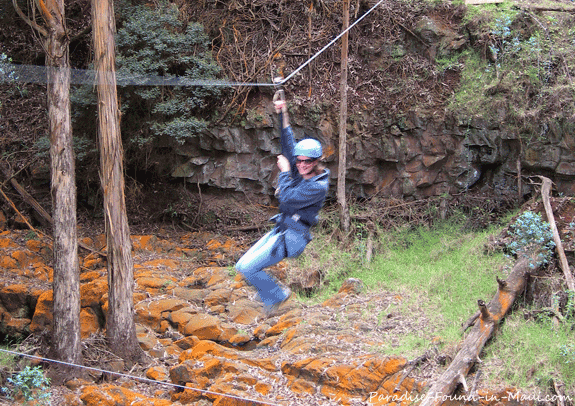 This tour would be a great choice if you're new to ziplining and don't want to start off with anything too crazy on your first time out. Unlike other ziplines I've been on since, the ones on this tour are fairly gentle on you when you're coming in for a landing, which is great if you don't want to get tossed around too much. And as I said, although the last line on this tour will give you quite the adrenaline rush, the rest of the zips are pretty tame. If you want to go ziplining, but don't want to get overheated on the walks between lines, this tour is perfect for that too. The higher elevation, combined with shaded trails here means it's highly unlikely that you'll get too hot. I liked that for pretty much all of this tour we were in the middle of picturesque forest, rather than, say, just in the middle of some grasslands. Another plus of this particular set of Maui ziplines is that it's on the way to the Haleakala summit - since the summit should be on pretty much everyone's must-see list for a visit to Maui, this works out rather well if you ask me! In our case, we went ziplining first thing in the morning, and headed to the summit after that. But it would work out equally well if you wanted to do it the other way around. For more information on tours, rates and bookings, I recommend you check out Barefoot Tours. When you get to their site, just click on "Maui", then scroll down to the bottom where you'll see a link to all of the available Maui zipline tours. 1) Read about our drive to the summit of the Mt Haleakala Volcano here. It's the perfect activity to fit in either before or after the zipline tour since you'll already be most of the way there! 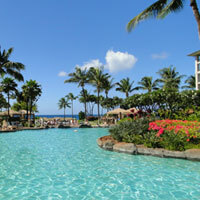 2) Looking for more great ideas for your next adventure in Maui? 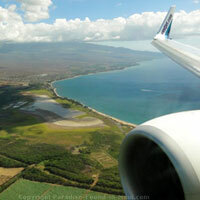 Click here to see our Top 10 Things to Do in Maui for Adventure!